"When I found you, I saw raw untamed power. And beyond that, something truly special." Who is that ominous voice referring to in the new trailer for Star Wars: The Last Jedi? Is it Rey? Or Kylo Ren? Rey's pull towards the dark side is the centerpiece of the new footage, which includes a scene where Luke Skywalker is visibly shaken by the strength growing inside of her. Will she grow to be another Darth Vader? Will she join Kylo Ren in The First Order? 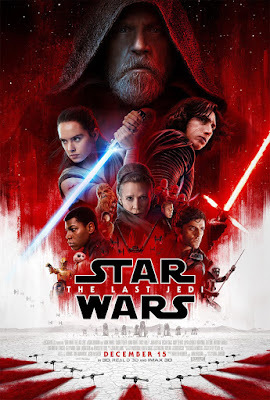 There's legitimate uncertain that comes with the middle chapter of a trilogy, much in the same way The Empire Strikes Back took the franchise to the darkest place it has ever been. From Snoke's appearance, to Kylo Ren considering the destruction of his own mother, General Leia, there are a number of dark paths for Rian Johnson to take. Hopefully that path doesn't lead to too many appearances by those porgs. Starring Daisy Ridley, John Boyega, Mark Hamill, Carrie Fisher, Adam Driver, Benicio Del Toro, Oscar Isaac, Kelly Marie Tran, Laura Dern, Gwendoline Christie, Domhnall Gleeson, and Andy Serkis, Star Wars: The Last Jedi opens December 15th. Tickets are available for pre-order now, so get yours here today!